The recent premieres in Vienna of the opera “Tri Sestry” and the ballet “The Snow Queen” show that, beyond the close ties between Russia and the Austrian capital, Russian art remains an inextricable part of the European cultural process. The Vienna State Opera chose to broadcast its most recent production, which was premiered March 6 to the standing ovation of the audience and much acclaim by the critics: the opera Tri Sestry (Three Sisters) by Hungarian composer Peter Eötvös, staged by Israeli-American director Yuval Sharon and German scenographer Esther Bialas. One of the best known contemporary European composers, Eötvös originally wrote this piece, based on Anton Chekhov’s play, for the Opera de Lyon in France in 1998. Even before the Vienna production, it had been performed more than 140 times in 16 European theaters. But never in Russia. So the March 6 broadcast, which became available to subscribers in Russia the following day, was actually the first time this piece, inspired by Russian culture and sung in Russian, could be heard and seen in Russia. Having lived and worked in Vienna for three years now, I can’t stop being amazed by the omnipresence of Russian culture in this Central European city. There are constant concerts by Russian musicians, both those who travel from Russia and those who reside here, regular productions of Russian plays in Vienna’s theaters, as well as companies coming on tours, while the Russian and Austrian governments organize joint “cultural seasons.” Besides this, there are sensational exhibitions in the local museums – as is the case now with a great show of Russian avant-garde art at the Albertina museum, where most paintings are provided by the State Russian Museum in St. Petersburg. And, yes, there is a street here named after Ambassador Prince Andrei Razumovsky, who was friend and patron to Haydn and Mozart and to whom Beethoven dedicated quartets and symphonies. And a sculpture by cearly 20th-century Russian artist Mikhail Vrubel, discovered recently in Gustav Klimt’s studio. Russian-Austrian cultural ties are indeed plentiful, and this has been so for centuries – as is the case, of course, with France, Germany, Greece and many other European countries. What makes Tri Sestry special in this context is that it is not actually a Russian opera. It is a piece of contemporary European music written in the Russian language on the basis of a classical Russian play and produced by an international team at the eminent European cultural institution that is the Vienna State Opera. It is not an import-export operation. It’s another level of cultural integration. It demonstrates how Russian culture, having parted with its roots, lives and develops within the common European cultural process. Plus, it is not the only example of the kind. Back in December, the Vienna State Ballet presented TheSnow Queen – a ballet by British choreographer Michael Corder based on Hans Christian Andersen’s fairy tale. Prokofiev's music in Western songs? Balalike it! What’s Russian about it? First of all, the music by Sergei Prokofiev. Corder said in an interview that as a young ballet dancer he fell in love with Prokofiev’s lesser-known ballet The Stone Flower and eventually merged Andersen with the Russian music. But not just that. He decided to move the setting of the Danish writer’s fairy tale from an unspecified northern country to somewhere further east – hence Kai and Gerda are dancing in a variation of Russian folk costumes amid a Russian-inspired wooden village, and the Snow Queen is modeled after tsarinas. The ballet, first shown in 2007, is now marching triumphantly from London to Vilnius and from Vienna to Prague. Corder – just like Eötvös – is dreaming of staging his piece one day in Russia. Not yet. There is an important nuance to this cultural entanglement. Both in the ballet and in the opera some of the leading parts are performed by Russian artists who live and work in Vienna. Olga Esina, prima ballerina of the Vienna State Ballet, who also dances for the Mariinsky Theater in St. Petersburg, was the enchanting Snow Queen. With Tri Sestry the situation is even more interesting. Originally, the opera was written for an all-male cast. 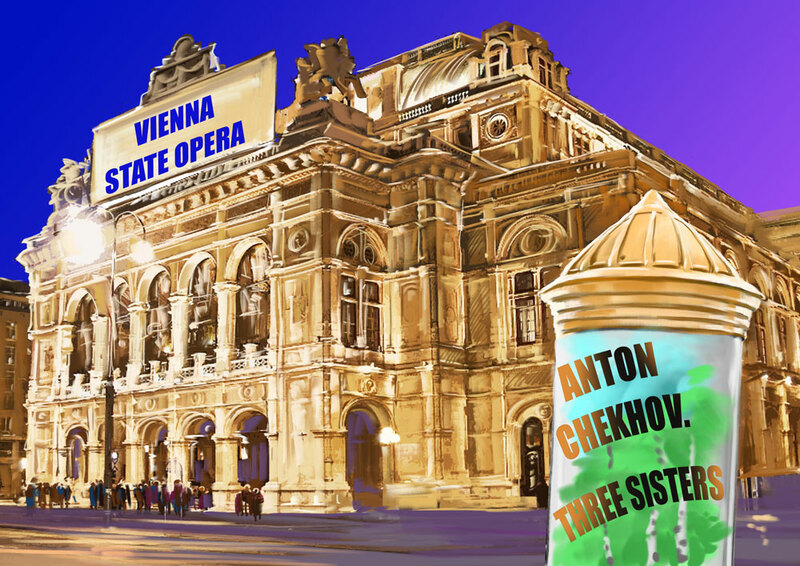 But the general director of the Vienna Opera, Dominique Meyer, asked the composer to make an adaptation so that three young Russian soloists from his theater, Aida Garifullina, Margarita Gritskova and Ilseyar Khaifullova, could appear as the three sisters – Irina, Masha and Olga. “I am so proud of my Russians! And happy that we have them!” he exclaimed at the reception following the first night. The opinion of the author may not necessarily reflect the position of Russia Direct, RBTH or its staff.